Whose in the mood for some cyclone vinyl action? 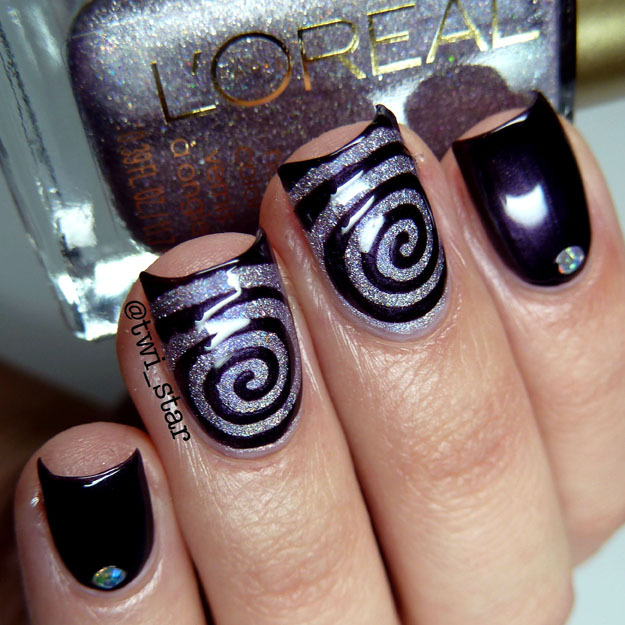 How great are these cyclone swirls from Twinkled T, gaaahhhhh I love them! They're hypnotizing and give such a unique look. This was my first time using these and I'm already imaging fun ways to use these again. Want to see more pics and details on products used?! Click below! For the ﻿base I used Loreal Masked Affair, just a lovely silver holo that has a bit of a lavender tone to it. 2 coats for opacity and it dries pretty quick. Then I placed the cyclone vinyls and used Julep Logan over them. Logan is a very deep aubergine shimmer, not so great formula but it's pretty so I got over it. I added a couple of iridescent 2mm jewels that I got from ebay. I love how Logan and Masked Affair look together! How about a macro?! Be careful, you might fall in it's all Twilight Zone on ya! These are definitely unique vinyls, Twinkled T is the originator of this style. I hope you enjoyed my instagram tutorial and mani, thanks for stopping by!